Cheaper than buying separately - I have recommended to family and friends. 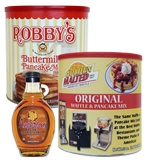 We love the Original and Robby's mixes. With this pack we save money. My grandkids love this mix and syrup!